With a Milwaukee history dating back to 1906,(Children’s Outing Association) has called Riverwest homesince 1970. When the agency moved into the community, it was a time of risingcrime and increased juvenile delinquency. COA brought with it over 60 years ofexperience, professional leadership and a trained, socially conscious staff. Itdidn’t take long for COA to be enlisted to help combat the problems facingRiverwest, and those early partnerships with area community leaders set thestage for what has now been four decades of positive change. COA moved first into an old Tewes Lime and Cement Company atthe west end of the North Avenue bridge. Government funding enabled staff toopen a teen lounge and programs for neighborhood kids. During the summer, a daycamp was held at Grant Park for neighborhood children. As the number ofprograms increased, so did the need for more space, and in 1971 COA purchasedits present headquarters at the foot of the reservoir on North Avenue. In September 1971, a Puerto Rican youth was shot in ajuvenile gang fight in a tot lot known as Baby Park on the corner of Bremen andBurleigh Streets. A group of concerned Riverwest citizens called on COA toassist them in relieving the tension in the area. COA staff members worked diligently with white, black andPuerto Rican youth who ultimately came up with their own idea of creating anindependent youth center. One gang helped raise funds for recreationalequipment; the other helped develop the youth center. The PRIDE CommunityCenter was established in a storefront on Locust Street where Woodland PatternBooks now stands. This cooperative effort among different ethnic groups was successfulfor many years. Another positive asset COA brought to Riverwest was itscamping programs. Children’s Outing Association began in 1906 with the purposeof sending kids to camp. Since COA moved into the neighborhood, Riverwestchildren have been able to take advantage of scholarship funding to enjoyeleven days of fun and adventure at COA’s Camp Helen Brachman. Winter andfamily camps provide shorter trips and Goldin Summer Day Camp in Kadish Parkgives kids a safe, fun way to spend their summers. 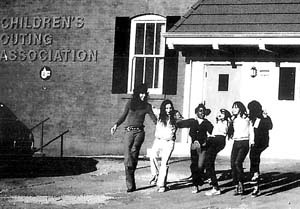 By 1973 COA staff members were helping at Franklin PierceSchool in the “Right to Read” program. By 1975 Riverwest parents wererequesting programs for their preschool children. Soon aninterracial/multicultural program for three- and four-year-olds opened. Withina few years it was expanded to include a before- and after-school program forschool-age children and full day child care. COA continued to expand programs for the neighborhood. In1979 an adventure playground was built on an abandoned garbage dump at the endof Meinecke Street. This unique play area provided programs for children and agarden for parents until 1990 when a new child care and community center wasbuilt on the site. In the early 1980s, teens and senior citizens were inconflict in the neighborhood around ESHAC (East Side Housing Action Coalition)on Burleigh Street. Youth were intolerant of the older adults and the adultswere afraid of the teens. ESHAC and COA intervened to help each age groupbecome more sensitive and aware of each other and to get along cooperatively.This joint project provided a bartering system. Teens provided communityservice work for the elderly (yard work, cleaning, running errands). In return,the adults taught carpentry, cooking, crocheting and sewing to the teens. By 1990 the increasing demand for quality child care andother programs for neighborhood families provided the impetus for COA to expandits Riverwest facilities. Just east of Kilbourn Park on Garfield Ave, theorganization built a new, nationally-accredited early childhood education andcommunity center on the site of the former Creative Playground and theadjoining lot to the east that had been occupied by the Unity Casket Company. A new gymnasium opened in 1992 that provided space forbasketball and volleyball leagues while also providing rental facilities forthe neighborhood. Next, COA opened a Family Resource Center, now the longest-servingFamily Resource Center in Milwaukee. Moms, dads, grandparents and guardianswere brought together as families to share the joys and challenges of raisingchildren. Families with infants and young children benefited from parentclasses, support groups and family drop-in days. The year 1998 marked the inaugural year of COA’s HomeInstruction for Parents of Preschool Youngsters (HIPPY). This nationally-acclaimedprogram helps parents become their child’s first teacher through the use of ahome-based curriculum. These programs were started in partnership with FratneySchool in Riverwest. The twenty-first century was marked by a major expansion ofprograms for Riverwest and surrounding communities. Kilbourn Park wastransformed into a neighborhood jewel with a spectacular skyline view ofMilwaukee. COA played a lead role in the creation of the Riverwest Health Initiative,which joined with Pierce and OW Holmes Schools, Community Partners, and theRiverwest Neighborhood Association to provide enhanced services to thecommunity, including door-to-door health information and free community healthservices to Riverwest residents. For 104 years, COA has been serving children and families.Today, they come from throughout Riverwest, seeking quality nationally-accreditedchildcare, after school and summer programs for children and teens, adult basiceducation / GED classes and family programs. Residents enjoy the parks andparticipate in COA events. And COA continues to grow. In 2010, COA will servemore than 25,000 children and families citywide at 42 locations. But Riverwestis still home.